Guangdong Cuisine, one of the main cuisine styles in China, is composed of Guangzhou, Chaozhou and Dongjiang cuisine. With the advantages of all delicacies from all over the country, Guangdong Cuisine has gradually formed its own characteristics - using a wide variety of ingredients, offering food of all tastes, shapes and colors, good at changing, and serving light food in summer and autumn, and strong and mellow food in winter and spring. Guangdong Cuisine features sour, bitter, spicy and delicious tastes with a clear and fragrant smell. Guangdong snacks are peculiar about ingredients, some sweet and some salty, enjoying the reputation of "100 kinds of snacks having 100 tastes and 100 shapes." There is an old saying: "Guangdong serves best food in the country." Now we can say: "Guangdong offers delicacies from all over the world." Famous dishes: Fried Bean Curd and Fresh Shrimps, Baiyun Pig's Trotters, Roast Piglet with Crisp Skin, Dongjiang Salted Chicken, Refreshing Beef Balls, Taiye Chicken, Fried Jelly Fish, etc. Snacks: Guangdong produces a great variety of snacks with different tastes, such as moon cakes, porridge, chicken cakes, pastries, red sweetened bean paste, double skin milk, etc. Guangzhou, the place of origin of Guangdong Cuisine, offers more than 2,000 kinds of dishes, which represent all strong points of various cuisine styles in China. Prepared with high-quality materials, and varied ingredients, Guangzhou Cuisine is composed of light, delicious, refreshing and nutritious dishes with sour, sweet, bitter, spicy, salty and delicious tastes. Many dishes are good to the people's health. Eight Immortals Banquet, which was created on the basis of a popular fairytale about the eight immortals, makes the Guangzhou Panxi Restaurant famous. Each course is named after an immortal, plus unique tableware. etiquette and service. The banquet starts from the gathering of the eight immortals, and ends at the eight immortals crossing the sea, full of interest. Evolved from "Monk Jumps over Wall," a famous dish from Fuzhou, Aromatic Pot is made of various ingredients, such as chicken. goose, duck, fish's lip, dried mushroom, etc., which have been cooked separately beforehand, plus some Shaoxing cooking wine. Richly fragrant, this dish is nutritious and is suitable for people to eat in winter. As one of the commonest chicken dishes in Guangdong Cuisine, White Cut Chicken is easy to be prepared. This dish features tender and delicious meat, and original taste and juice. As a famous dish of the Guangzhou Dasanyuan Restaurant, this dish is made with high quality shark's fin after meticulous preparations. Chefs pay great attention to the duration and degree of heating and cooking while preparing this dish. If a guest picks up a ready-made shark's fin with chopsticks, the cooked shark's fin will naturally form an oval shape, which tastes crisp and delicious. 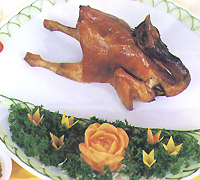 Roast Piglet with Crisp Skin is a traditional dish in Guangdong Cuisine with a history of more than 1,400 years. As early as in the Southern and Northern dynasties (420-581), Guangdong chefs were good at preparing roast piglet. Roasted with an open stove, Roast Piglet features a beautiful golden yellow color with crisp skin. Panxi Restaurant enjoys the highest reputation of producing refreshments in Guangzhou. At such banquet, various kinds of refreshments are served in a good order: First small pastries, then pastries in soup, main refreshments, sweet snacks and finally desserts, in addition to a delicate, refined and graceful atmosphere. Dishes, which are popular in Heyuan region, are known as Hakka Cuisine. Fat, salty and well done, many dishes of Hakka Cuisine can help nourish yin, qi and the kidney, reduce heat, clear the lung, brighten the eyes, and improve the skin. Famous dishes include Dongjiang Salted Chicken, Dongjiang Bean Curd with Filling, Salty and Fragrant Chicken, Crystal Duck, Mandarin Fish in Soup, Steamed Chicken, Beef Set Meal, Delicacies from Xingang Lake, in addition to local refreshments, such as Bawanghua Rice Noodles, and Niujin Cake. 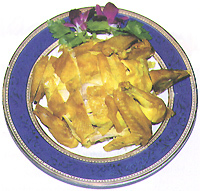 It is a famous traditional dish in Hakka Cuisine, featuring a golden yellow color, crisp and tender meat and a fragrant smell. With grass carps bred in local high-quality waters as raw materials, this dish is prepared with various kinds of seasonings, featuring tender, delicious and refreshing fish meat. It is a newly created Hakka dish, with a yellow and bright color, delicious original juice, tender meat and a good smell. This dish is prepared with traditional Hakka cooking techniques, with smooth and tender bean curd, delicious filling, hot soup and a fragrant smell. Meticulously prepared with mandarin fish from Wanlu Lake, this dish is peculiar about skills in the use of a kitchen knife, with a milky white color, a delicious taste and refreshing, sweet and tender meat. 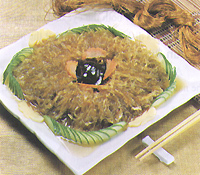 This dish is composed of bitter gourds, peppers and eggplants with filling, with three different colors. beautiful shapes and a unique taste. Shenzhen, a beautiful seaside city, gathers all catering cultures and all cuisine styles and over 1,000 kinds of snacks from all over the country. Huaqiangbei Food Street with Huaqiangbei Road and Zhenhua Road as the centers is the largest catering center in Shenzhen. Other food streets include Dongmen Food Street, Nanyuanlu Food Street and Yantian Seafood Street, which are attractive to domestic and foreign tourists. Big Basin Dish consists of 15 courses, prepared with a big wok heated with firewood. Through stir frying, deep frying, boiling, braising and stewing, more than 10 courses are placed in a big basin. 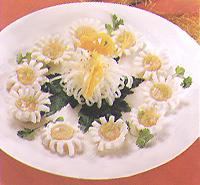 The course on the top is chicken and duck, implying that birds return to the nests. Since ancient times, the people in Guangdong coastal areas, New Territories in Hong Kong and Southeast Asia have followed the custom of eating Big Basin Dish on the Lantern Festival, which falls on the 15th day of the first lunar month.